Stay ahead of the game with this comprehensive guide to the C# programming language Well-known C# expert Rod Stephens gives novice and experienced developers a comprehensive tutorial and reference to standard C#. This new title fully covers the latest C# language standard, C# 5.0, as well as its implementation in the 2013 release of Visual Studio. The author provides exercises and solutions; and h… is C# Helper website will provide readers and students with ongoing support. This resource is packed with tips, tricks, tutorials, examples, and exercises and is the perfect professional companion for programmers who want to stay ahead of the game. Author Rod Stephens is a well-known programming authority and has written more than 25 programming books covering C#, Java, VB, and other languages. His books have sold more than 150,000 copies in multiple editions. This book's useful exercises and solutions are designed to support training and higher education adoptions. 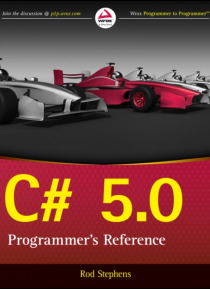 Learn the full range of C# programming language features Quickly locate information for specific language features in the reference section Familiarize yourself with handling data types, variables, constants, and much more Experiment with editing and debugging code and using LINQ Beginning through intermediate-level programmers will benefit from the accessible style of C# 5.0 Programmer's Reference and will have access to its comprehensive range of more advanced topics. Additional support and complementary material are provided at the C# Helper website, www.csharphelper.com. Stay up-to-date and improve your programming skills with this invaluable resource.